Plethora - PLETH-uh-ruh, noun: Meaning: Excess; superabundance. Join your hosts Jules_Uno and Degree as they showcase the Artistic and Musical talents of some of the area's very best emerging artists. Art will be on display from seven talented local artists, all mixed with the sounds of six Dee Jay's creating just the right ART PartY Soundscape. 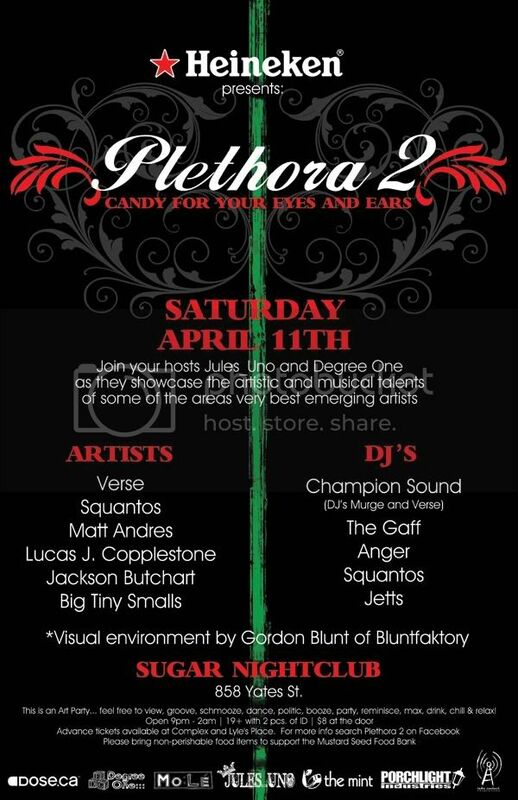 Building on the incredible success of the first edition of Plethora in Nov. 2008, this show promises to be bigger and better. VERSE, SQUANTOS, MATT ANDRES, LUCAS J. COPPLESTONE, JACKSON BUTCHART, BIG TINY SMALLS and Visual Environment by GORDON BLUNT. CHAMPION SOUND (DJ’s MURGE & VERSE), THE GAFF, ANGER, SQUANTOS and JETTS. This is an Art PartY... feel free to view, groove, schmooze, dance, politic, booze, party, reminisce, max, drink, chill and relax. Show 9PM – 2AM - Ages 19 years and over. TICKETS ON SALE NOW and will also be available at the door night of party. Advance Tickets: $8 Available at Complex and Lyle's Place.